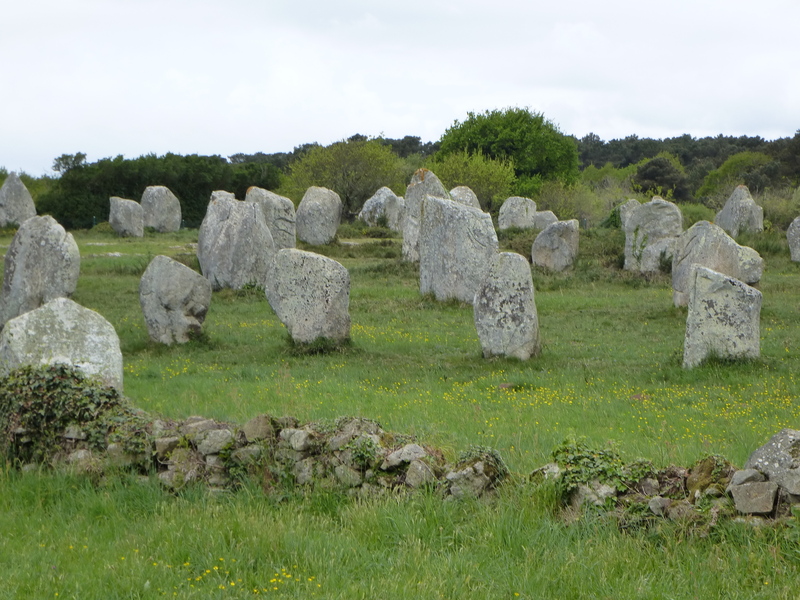 The huge complex of standing stones at Carnac in Brittany is, quite deservedly, world famous. With row upon row of huge megaliths running for kilometres across the landscape, it is hardly surprising that these stones have fascinated generations of antiquarians and now attract thousands upon thousands of tourists every year. The large numbers of visitors have inevitably had an impact on the fragile environment of Carnac, and as a result the majority of the stones are now kept behind fences, far from the fingers (and feet) of inquisitive day-trippers. So, although they are an amazing sight, the best-known alignments of Carnac can seem rather distant, untouchable, lacking that certain uncanny atmosphere that I love so much. 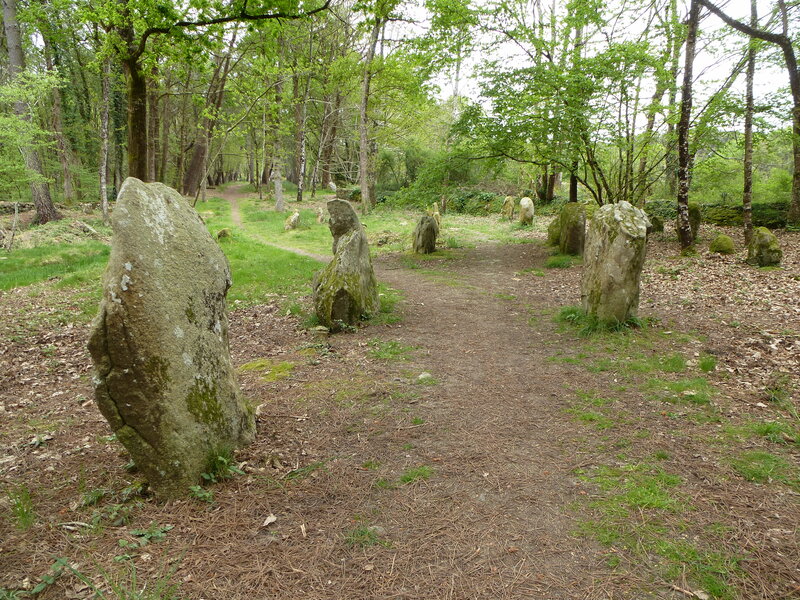 What few of the visitors to Carnac realise is that there is in fact one set of the stones which remains rather overlooked, and still retains a wonderfully air of magic. 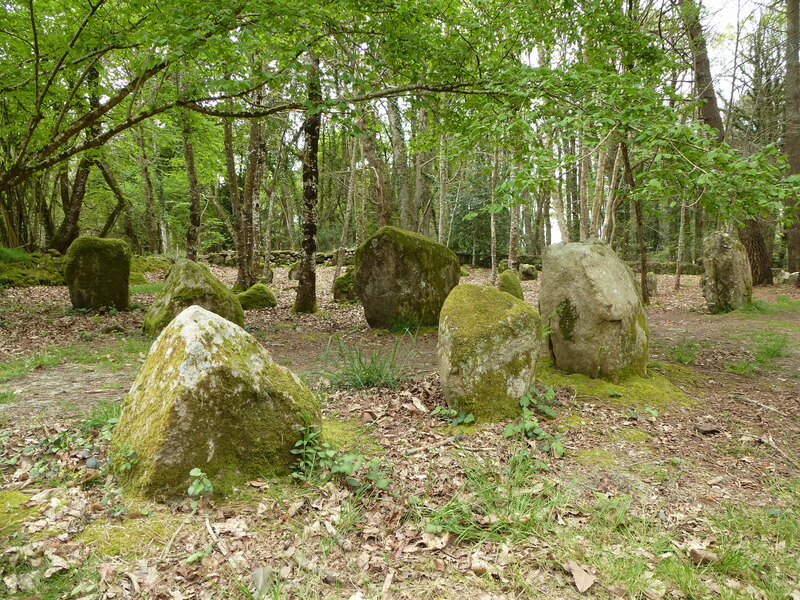 The stones of the alignements du Petit-Ménec, which sit at north-easterly end of the complex, might be smaller than some of their better-known neighbours, and may be rather hidden in woodland, but the fact that they remain open and unfenced means that visitors can still wander among them and get a real sense of their unique ancient mystery. 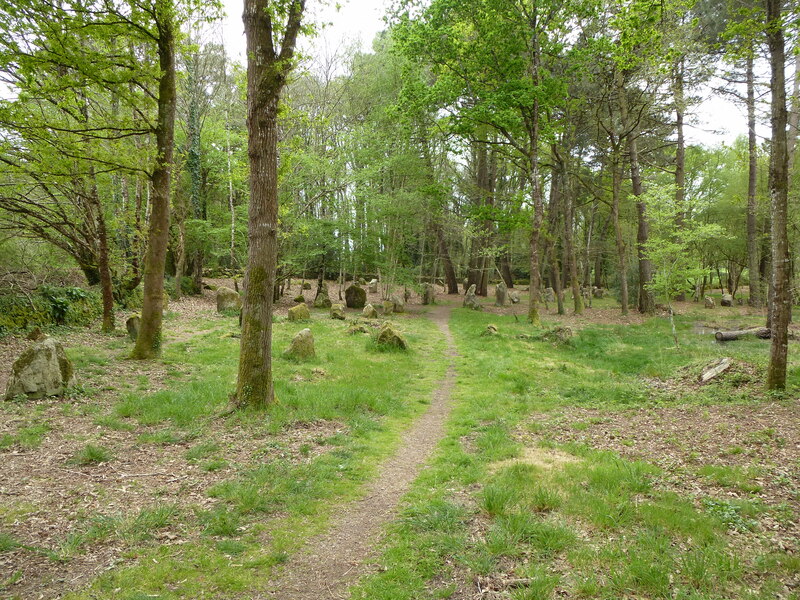 Although they do appear on most of maps of the complex, the alignements du Petit-Ménec are not properly signposted, and lie quite a distance from the other megaliths beyond a busy main road. This is perhaps why they tend to be ignored by most visitors to the Carnac stones. Whatever the reason, I am rather glad that they are overlooked. Hidden in a quiet woodland, far from the crowds and their cars, the alignements du Petit-Ménec are a magic-hunters dream come true! There are plenty of fabulous tales associated with the stones, including the (rather anachronistic) story that they were marching Roman centurions turned to stone by the wizard Merlin. Another legend tells that they are in fact a fleeing army of Pagans literally petrified by Pope Cornelius. All in all there are 101 standing stones in the Petit-Ménec group, with seven rows facing east and a further three facing north-east. Wandering amongst the stones in their peaceful forest, its easy to imagine yourself in some enchanted wood. I didn’t see any fairies, goblins or Korrigans on the day of my visit, but if I had, I am not sure I would have been that surprised. After all, I can’t think of a more suitable place for them than the magical alignements du Petit-Ménec. This entry was posted on May 13, 2015 at 5:22 pm and is filed under Brittany, Fairy Tales, History, Standing Stones, Woods with tags Bretagne, Breton, Brittany, France, Megalith, Pre-historic, standing stones, Woods. You can follow any responses to this entry through the RSS 2.0 feed. You can leave a response, or trackback from your own site. How fantastic! I would love to explore these, and how good that they remain undisturbed and relatively unknown. It’s a sad fact of our modern era that places like Carnac and Stonehenge have to be ‘protected’ for their own good. Yes I remember going to Carnac as a child and walking amongst the stones, and it is sad now that you can only peer at them from afar. Luckily a few places like Petit-Menec survive that still have some special magic about them. Many thanks, I haven’t had the chance to update the blog in the past few months, but it is good to know that people are still reading it!